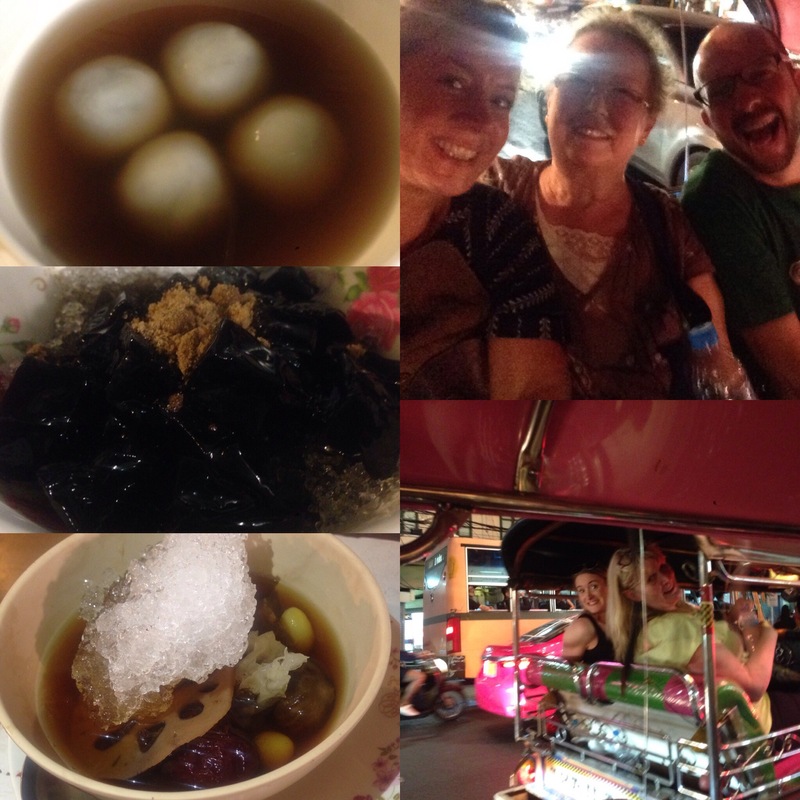 With mum in Bangkok of course we took the opportunity for another food tour. 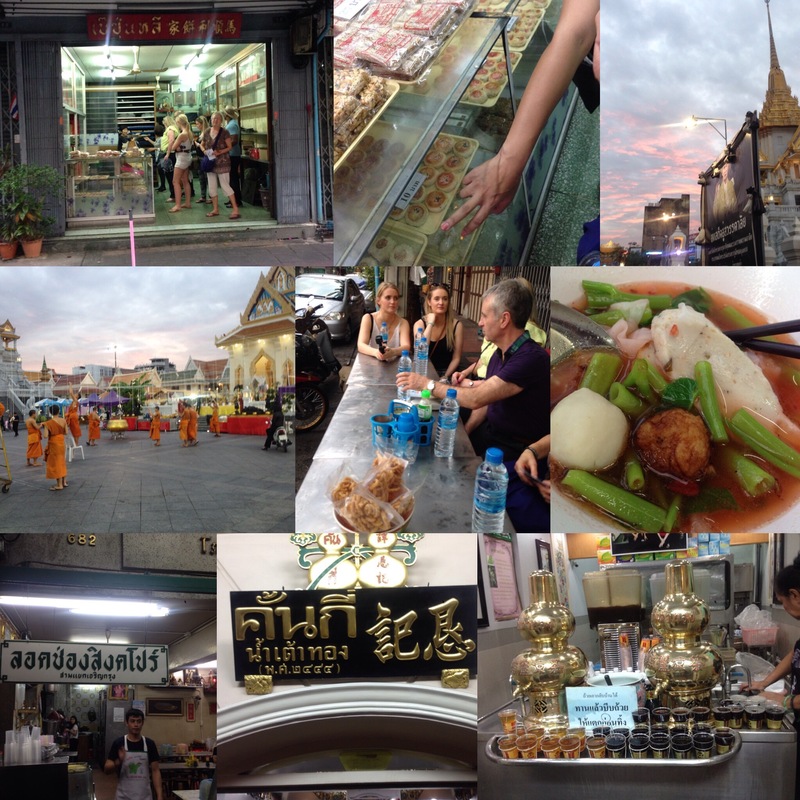 This time we chose Taste of Thailand’s ChinaTown Food Tour. 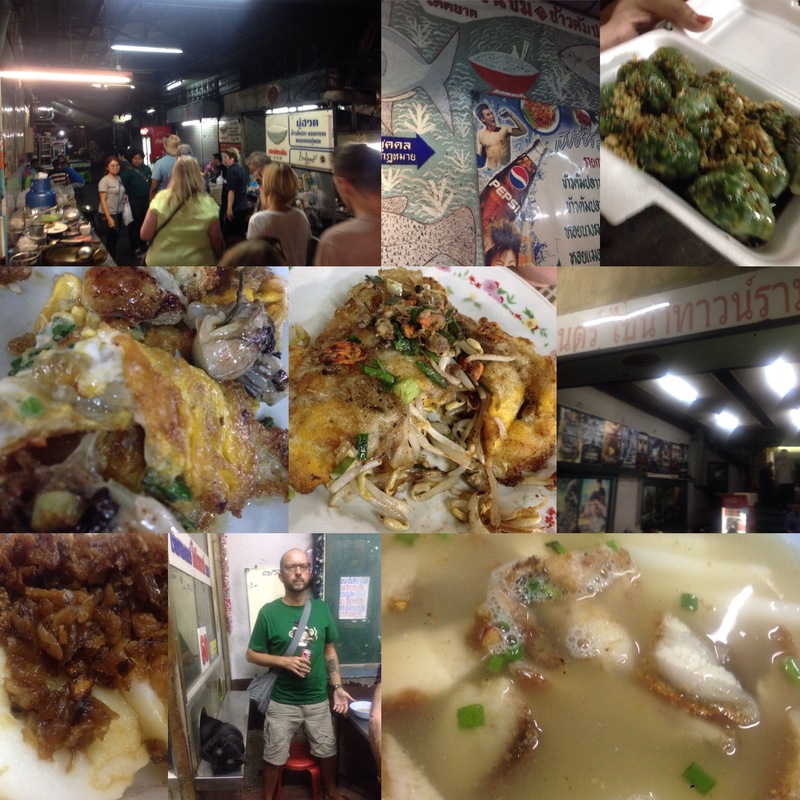 On a hot and balmy Friday evening we met the rest of our intrepid tasters at Hua Lamphong MRT station. A lovely family from Darlington, UK and Derek a lone male from Maryland, US. Jah and Jo our guides were great, shepherding us through the crowded streets and answering our mostly inane questions. Our first stop a short walk away was at Bae Sun Li for Chinese Cakes, we each chose two from an assortment of bean, vegetable, sesame seed and salty egg filled pastries which were pretty lovely. Next we headed to Yen Ta Fo where we sat at a narrow curbside table opposite the impressive Wat Trimetre, where the monks were readying prayer ropes for tonight’s New Years Eve celebrations. Here we were treated to a red flat noodle soup with prawn ball, fish ball and slices of fish sausage. The highlight for me were the amazing pork scratchings that you could add to your bowl. I don’t need to have the soup again but it was nice to try. Feeling a little peckish now thankfully we headed to Canton House for dim sum and plates of delicious garlicky greens which reminded me of grape vines. 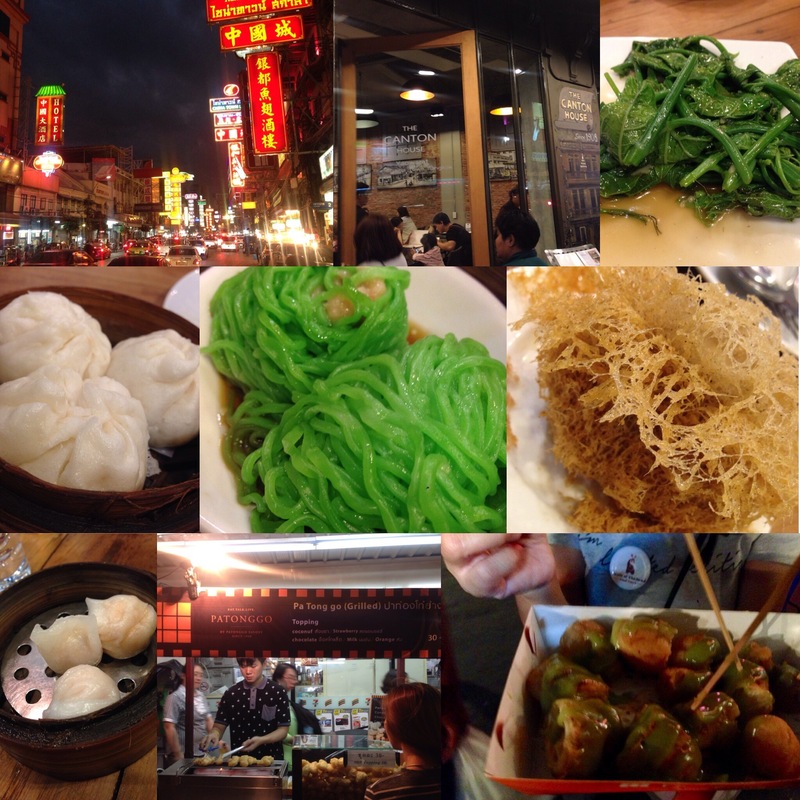 We enjoyed soft yummy pork buns, so so steamy prawn dumplings, odd green noodle coated dumplings reminiscent of Oscar the grouch 😜 and bizarre taro fired balls of fluff that looked like a cooked bunny but were quite tasty. Making our way through the throngs of people past stinky durian stalls and crowded seafood streetside restaurants with giant prawns piled high, we made our way to a tiny streetside stall Pathongko and their marvellous revenge doughnuts. Fried and then grilled dough coated in pandan custard, these were a big hit with all of us. (Such a big hit that when we finished at the final stop on the tour we all headed back there for some more). Happily doughnuted up, our next stop was in a slightly smelly alleyway, suitable surroundings for the less appealing Fried oyster and then fried mussels both with greasy fried egg, we were split in to two tables but apparently both tables would have been happy to skip this stop. The oyster made me think of eating animal balls, 😳 not that I’ve ever done that but the texture was exactly as I would imagine it would be, so pretty gross then and the mussels were so coated in pepper as so be inedible to mine and everyone else on my tables wimpy western palate, ha! Following in the peppery theme and at separate tables again was our final savoury stop for roasted crispy pork with rolled noodles in pepper soup. The open fronted restaurant is in the entrance to an old cinema, big cooking vats taking up the front centre and the walls are covered in movie posters, the ticket booth given over to several lounging cats for the evening. It was far too peppery for me and mum but Jason and his table liked it. I had radish covered rice flour cakes as a substitute; the radish was delicious although tasted nothing like any radish I’ve ever eaten. Squeezing our way back into the river of people we headed to Sweet time desserts, another alleyway eatery and our final scheduled stop. Lovely bowls of ginger soup with black sesame paste filled rice flour dumplings, black cubed jelly and a crushed ice melange of cooked lotus seeds, mushroom, lotus root and stewed plums in a super sweet syrup were placed on the table. The ginger strong enough to blow your head off was a mixed hit, some of us preferring the gentle syrupy melange. It was at this point that we headed back through the increasing crowds to Pathongko before piling in to Tuk Tuk’s for what turn out to be a traffic snarled then break neck speed trip back to the MRT, paid for my Jah.